From the New York Times bestselling and controversial author Shelby Steele comes an illuminating examination of the complex racial issues that confront presidential candidate Barack Obama in his race for the White House, a quest that will be one of those galvanizing occasions that forces a national dialogue on the current state of race relations in America.Steele argues that Senator Obama is caught between two classic postures that blacks have always used to make their way in the white American mainstream: bargaining and challenging. Bargainers strike a "bargain" with white America in which they say, "I will not rub America's ugly history of racism in your face if you will not hold my race against me." Bill Cosby's sitcom in the 1980s was the classic example of bargaining. Obama also sends "bargaining" signals to white America, and whites respond with considerable gratitude-which explains the special aura of excitement that surrounds him.But in order to garner the black vote-which is absolutely necessary for victory in the primaries and the general election-Obama must also posture as a challenger. Challengers are the opposite of bargainers. They charge whites with inherent racism and then demand that they prove themselves innocent by supporting black-friendly policies, such as affirmative action. If whites go along with this-thereby proving their innocence-they are granted absolution by the black challenger. The current black American identity is grounded in challenging. Obama must therefore posture as a challenger to win the black vote. However, challenging threatens Obama's white support. But bargaining threatens his black support. Thus, he is bound. He walks in an impossible political territory where any expression of what he truly feels puts him in jeopardy with one much-needed constituency or another. Only a kind of two-sided political mask, or an "above politics" posture, keeps the wolves at bay. 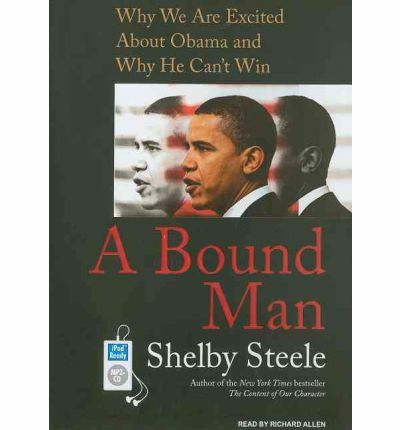 About the Author: Shelby Steele is a research fellow at the Hoover Institution and Stanford University, and is a contributing editor at "Harper"'s magazine. His many prizes and honors include the National Book Critics Circle Award, an Emmy Award, a Writers Guild Award, and the National Humanities Medal.Richard Allen and S. Ishii Gonzales both teach at New York University, where Richard Allen is Chair of Cinema Studies. Note: This AudioBook is in mp3-CD format. This means that it will only run on a cd player especially set up to play mp3-CDs. It as well can be loaded onto a computer workstation and duplicated over to varied mp3 players and played on them.